The tale of Jason and the argonauts, medusa and of course the quest for the golden fleece, are all well known. Chronicling this quest in an online game is the team at Microgaming, with their slot Jason and the Golden Fleece. So, let’s set sail and begin our quest into the unknown world of myth and magic. Jason and the Golden Fleece is a 5-reel, 25 fixed pay line slot, that offers an RTP of 96.54%; not even Medusa could be angry with that! The game is set against the backdrop of the open sea and it appears we are on a journey aboard Jason’s ship. You will notice characters such as Medea, Chiron and of course the Argonauts. Also, you will see the places Jason visits such as Iolcus, Mysia and the ship Argo makes an appearance as well. Microgaming have certainly put a lot of thought into creating the symbols for Jason and the Golden Fleece, let’s hope it pays off. 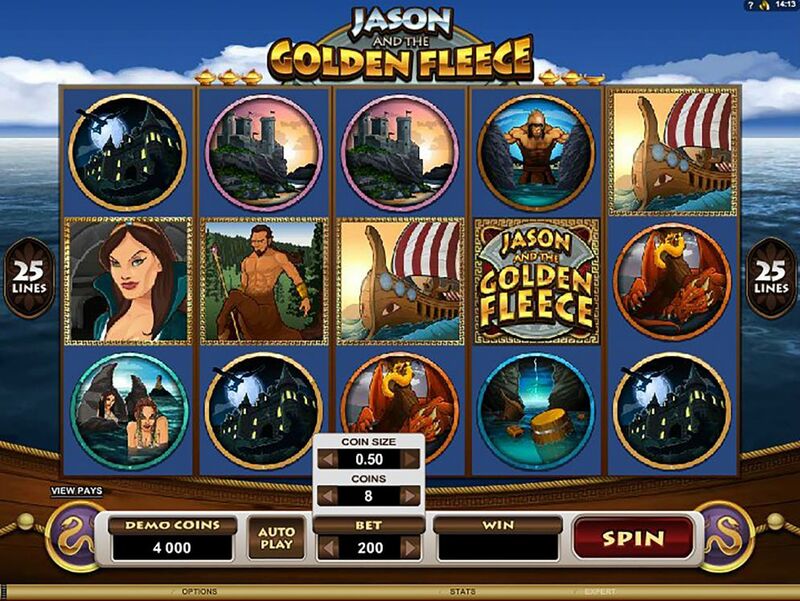 Bet Amounts – Betting on Jason and the Golden Fleece begins at 25p per spin and can be increased to a maximum of £250 per spin. You do this by using the arrows either side of the bet amount, to adjust your stake before each spin. But make sure you are happy with the stake before pressing spin. Wild Symbol – Your wild symbol is the Jason and the Golden Fleece logo, and it will substitute for all other symbols except the scatter. But, the wild also doubles as a scatter symbol and landing three or more of these anywhere on the reels will trigger the bonus spins feature. Any wins formed with a wild substituting will be doubled. Scatter Symbol – The golden fleece is your scatter symbol and landing three or more on the reels, will trigger the Jason’s Journey feature game. Scatter wins are also in play in this game and will be paid on top of any line wins received. This symbol is the highest paying symbol within Jason and the Golden Fleece, offering a massive 25000 coin win for landing five scatters. 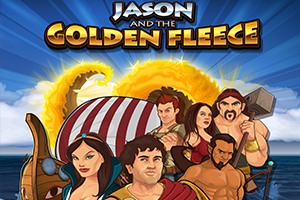 Bonus Spins Feature– By landing three or more of the wild/scatter combi symbols on the reels of Jason and the Golden Fleece, you will trigger the bonus spins. You will be allocated 10 spins with a x3 multiplier attached to any wins made during the round. As an extra, the bonus spins can be retriggered during play so the potential for wins here is big, if you are lucky enough to land three more wild/scatter combi’s that is! Colchis (potion bonus) – its time to fix a magic potion to help the dragon sleep. Choose as many potions as you think is needed. The potion will put the dragon to sleep and the longer he sleeps the bigger the rewards. Wow what a game Jason and the Golden Fleece turned out to be? Jason’s Journey was immense and once you trigger it the first time, you feel like you need to see it through. Overall the game was entertaining enough, and the wins certainly came often enough to keep a player’s attention. Whether you know the tale of Jason or not, this game is sure to be enjoyable regardless.